An anthology celebrating the 30th anniversary of the Predator franchise, If It Bleeds includes 17 brand new, never-before-seen or heard stories - exclusive to this collection - featuring the Predators throughout space and time. 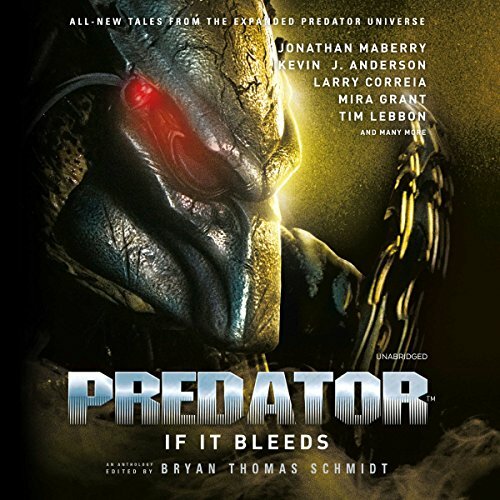 Based entirely on the original films, novels, and comics, Predator: If It Bleeds (a quote from the original movie) reveals the Predators stalking prey in 12th-century Japan, ninth-century Viking Norway, World War I, Vietnam, the Civil War, Hurricane Katrina, and the modern day, as well as across the far reaches of future space. "Devil Dogs" by Tim Lebbon "Stonewall's Last Stand" by Jeremy Robinson "Rematch" by Steve Perry "May Blood Pave My Way Home" by Weston Ochse "Storm Blood" by Peter J. Wacks and David Boop "Last Report from the KSS Psychopomp" by Jennifer Brozek "Skeld's Keep" by S. D. Perry "Indigenous Species" by Kevin J. Anderson "Blood and Sand" by Mira Grant "Tin Warriors" by John Shirley "Three Sparks" by Larry Correia "The Pilot" by Andrew Mayne "Buffalo Jump" by Wendy N. Wagner "Drug War" by Bryan Thomas Schmidt and Holly Roberds "Recon" by Dayton Ward "Gameworld" by Jonathan Maberry The complete list of narrators includes Tom Taylorson, Nicol Zanzarella, Traber Burns, Bradford Hastings, Bahni Turpin, Emily Sutton-Smith, Ulf Bjorklund, James Patrick Cronin, Andrew Eiden, Scott Brick, Feodor Chin, John Pruden, Mark Bramhall, Dan John Miller, Peter Berkrot, and John McLain.